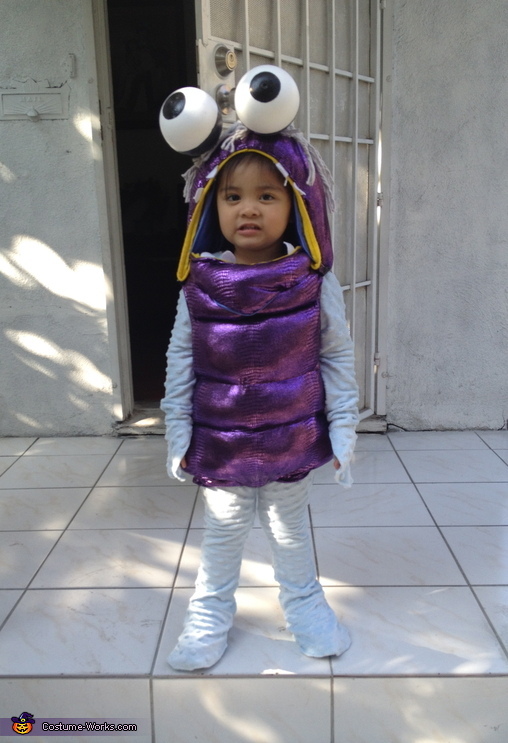 This custom homemade costume is worn by my niece Destiny. Since she was a little over a year old everywhere we went random people would tell me she looks and resembles Boo from Monsters Inc. so from that decided it would be cute and a great idea to have her dressed up as Boo this Halloween. Boo is a costume that cannot be found in stores, so being creative and making it was the only way to go if I really wanted her to be Boo. I purchased all the materials from fabric stores and craft stores. I cut the fabric piece by piece, sewed them, stuffed them and attached everything together. My attempt was to test make one to see how it came out, but on my first try it came out perfectly fine. I was really satisfied with it not only because it came out great, but because I only spent no more than $30 on supplies. I can't wait for her to show off her costume on Halloween Day. Thats my baby girl as Boo! Love it!